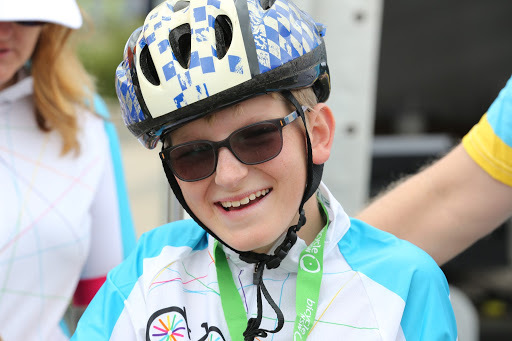 Meet Mitchel, a fundraising superhero who at only 15 years of age is making a difference to other kids just like him.Through Freedom Wheels – TAD Mitchel has made a tremendous difference to countless lives and continues to do so through this Sunday’s Spring Financial Group Spring Cycle. Mitchel was born with Cerebral Palsy which means for him the simple things we all take for granted each day are hard for him to achieve such as walking and daily living. This is where his drive and passion for raising funds for Freedom Wheels comes from his own personal experiences with Cerebral Palsy. As a parent, what you want most for your child is to be happy and to gain the same experiences as other kids. At the age of three, Freedom Wheels gifted Mitchel this happiness and freedom with his first custom made Freedom Wheels bike. As Mitchel developed in age he received a bike to suit him at each stage in his life. Since then, he has had six bikes all of which have enabled him to participate in school sports carnivals, go to the beach, play soccer with his two brothers and even race with the Southern Cross Cycling Club. Riding his bike over the years has allowed Mitchel to strengthen his muscles, build on his spacial awareness and move around more freely than he would in his wheelchair. 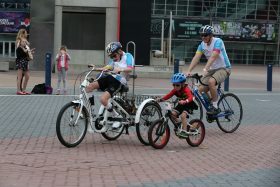 Mitchel riding alongside his brother and father at the Sydney Olympic Park finish line. Image Supplied. Since having his bike Mitchel has participated in four Spring Cycle events! Having completed the 10km and 16km events in the past, he now looks to show a fellow Freedom Wheels rider and her family the ropes of the 10km City Ride this Sunday. Not only is he a superstar on course but also off course having raised over $16,000 for Freedom Wheels to ensure that other kids also living with a disability have the opportunity to enjoy the joys he feels every day. 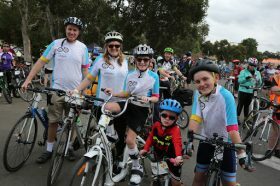 Mitchel’s involvement with Freedom Wheels – TAD has allowed him to “give back to the community through fundraising, increasing awareness of the organisation and sharing my experience with other children.” – Mitchel. Did you know that you too can help make a difference just like Mitchel does. Every $1000 raised provides a bike to another child in need. These bikes allow kids to get out of their wheelchairs and ride but they also allow them the freedom to experience life’s little joys that they would otherwise miss out on. Start a fundraising page now! Mitchel with his whole family. Image Supplied. What’s your favourite thing to do with friends on the weekend? Ride my bike. Who is your favourite superhero and why? The flash because he moves so fast and I don’t. What was the last film you watched? The blue streak – silly comedy cop movie. If you could be any animal what would it be and why? A bird because they are free, wild and fly around. Join Mitchel and his family on course this Sunday and enjoy the freedom of riding! Entries close 5pm Saturday, October 13. Enter now!